As director of Silicon Valley Bank’s UK Corporate technology team, I love coming to work every day – I know I’ll learn something new from one of the UK’s top founders or CEOs. These are smart, passionate men and women committed to making a difference, whether they are at the helm of a fast-growth company or a global leader. I recently served as judge for the annual UK Tech Awards and in the course of that work interviewed 16 CEOs. Here are a few takeaways from those conversations that may be helpful to your business, whether you are in tech or not. 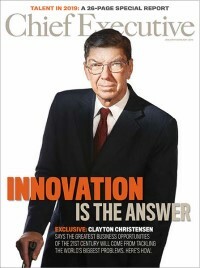 After all, every company today must be an innovator to thrive. I’m constantly surprised by how far into the future these CEOs are thinking – they see and plan for things that often are way over the horizon for most of us. The CEO and founder of a 10-year-old company described to me his original vision of where his company would be in 2020. I was amazed at how close he is to realizing that 2007 vision. Think for a moment about how much has changed for your company since in a decade. It’s always a challenge to stay focused and have the will to stick with your convictions. When asking a second CEO about his original vision, he laughed, confessing that he had no idea he would end up where he is. His ideas for the product and how people interacted with it had morphed over time. But he proved he could adapt to meet customer demand, while remaining ruthless about maintaining the precision of the product. I would add – and this is key – CEOs have a great ability to communicate their vision in a way that makes you want to be a part of it. I believe that most founder/CEOs have an extremely high EQ, as well as the soft skills most associated with managing people and difficult situations. Still, as business leaders with many stakeholders to please, they may not be in a position to show their awareness of the situation. This may sometimes come across as distracted or disinterested, but is rarely the case. Transparent communication, even when the news is bad, engenders trust and helps motivate people to follow you. I’ve had the fortune to spend some quality time cycling with founders and CEOs. Taking someone out of their corporate environment with a shared experience extends business relationships to a whole new level. The more rigorous the experience, typically the better the insight. It allows you to observe traits and values that may be hidden in the corporate environment. You may see a new side of their competitiveness, drive or empathy – to win clients and recruit the best talent. CEOs have to demonstrate this. One CEO learned quickly – which translated into smart decision-making – on picking which battles to fight and which ones to avoid. Many CEOs have an ego – the personal and professional sacrifices required to reach the top fuel this. But at the same time, many of these leaders willingly admit mistakes and acknowledge that no one person is solely responsible for their success. The very best CEOs and founders build a pool of talent around them that creates a cohesive and diverse team and shapes the culture of an organization. This culture drives a huge source of pride – especially as all the company’s intellectual property has been created by these talented people. The best CEOs are passionate. They’ve found what motivates them, and they never want to quit. In the corporate sense, passion describes a deep and intense interest in knowing how things work and trying to make things better. You can see the passion in someone’s eyes when you get them talking on their topic, and sometimes you will lose them for a few minutes while they completely zone out. It’s crystal clear how their unwavering belief in their vision drives them to find success, and, when back in the moment, how good they are at telling their story. So there it is… create your vision, go all in, choose your battles intelligently, embrace your passion and tell your story well. Easy, right?